Sanjay Dhar is an art conservator and heritage management consultant specialising in conservation of wall paintings. He studied conservation at the National Museum Institute of History of Art, Conservation and Museology, New Delhi followed by a 2 year diploma at the Università Internazionale dell’Arte, Italy. He was instrumental in establishing the INTACH Art Conservation Center in Delhi as a center for excellence with focus on developing a region specific approach to conservation and training. He has contributed significantly to the conservation of wall paintings, establishing region specific methodology and mentoring a large number of conservators. 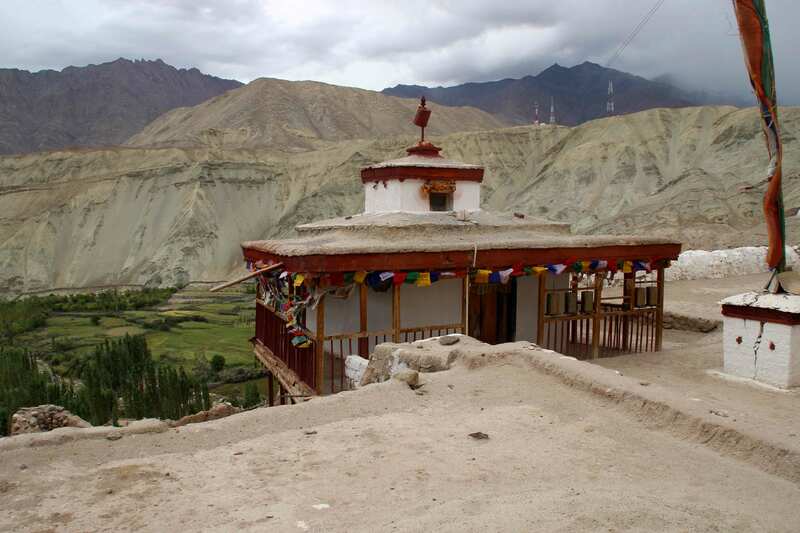 His focus over the years has been on Buddhist wall paintings in the Ladakh region. 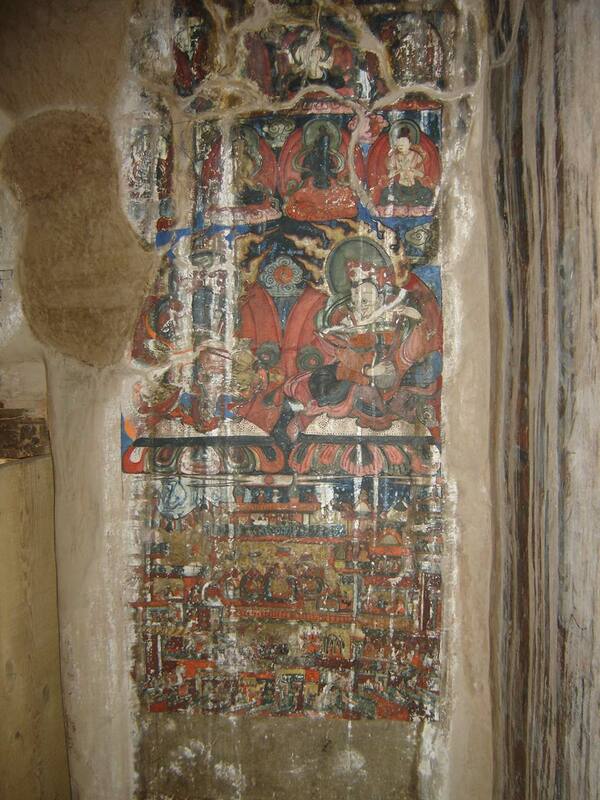 His important projects include the restoration of wall paintings at Basgo, Shey and Hemis. 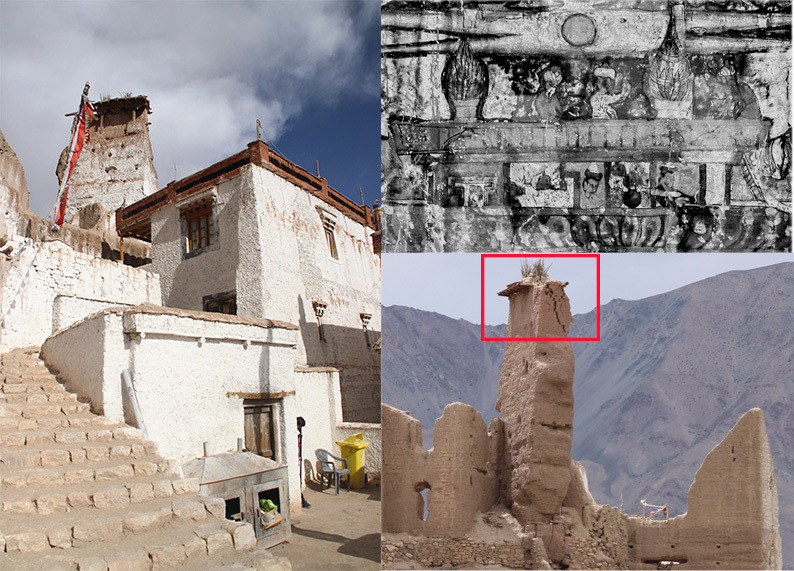 The external appearance (suggestive of a mosque or central Asian structure) of the small temple Cham Chung, is deceptive (Fig. 1). Once inside, it is hard to imagine or associate the structure with a ‘mosque’. 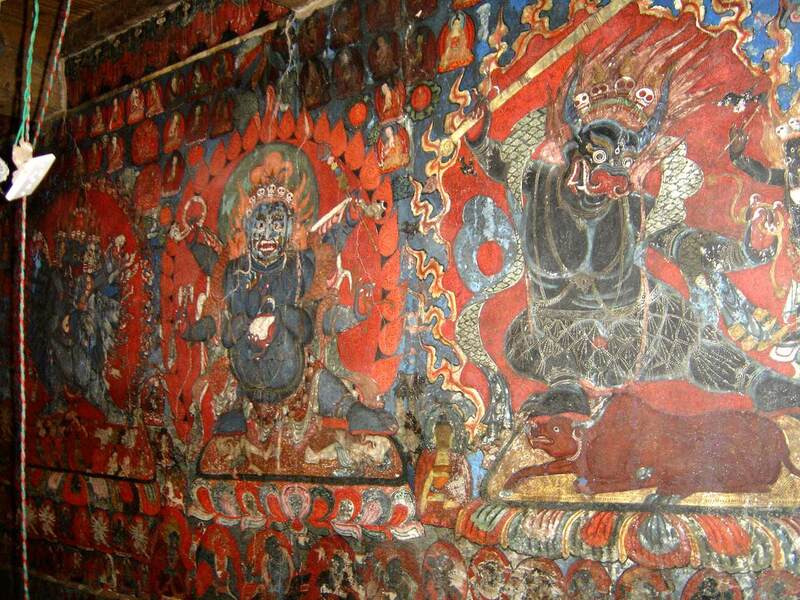 The walls are covered with popular, fierce and wrathful deities—a shift from the peaceful and quiet iconographic programme in both Chamba Lhakhang and Chamba Serzang. 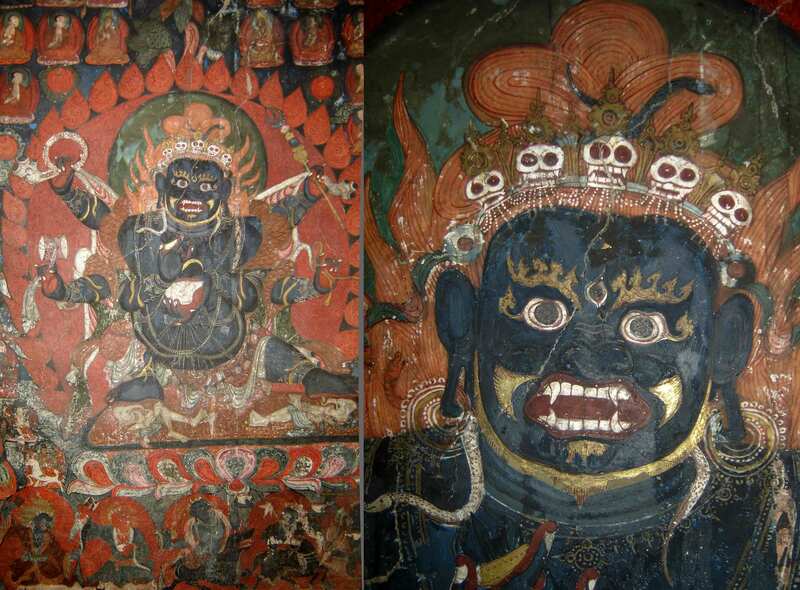 The wrathful deities in Cham Chung have been executed in the fully developed Central Tibetan style, along with elements of the Newari (Nepal) style, particularly the red colour in the prabhamandala (aura). The details are very fine, with intricate patterns on the textiles, and the halo adding to the overall effect. A painted stucco sculpture of Maitreya—fondly referred to as the ‘gentle small one’ (in comparison to the monumental statues in the other two temples)—is depicted seated on a platform, slightly off-centre in padmasana (cross-legged) posture, with the hands in the dharmachakrapravartan mudra (the gesture of setting the wheels of dharma in motion) (Fig. 2). 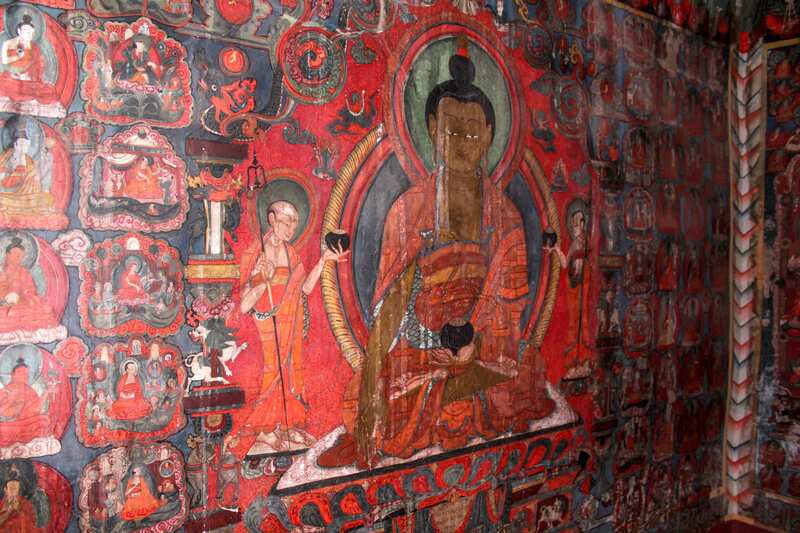 South Wall: On the southern wall, behind the sculpture, is a large panel dedicated to Shakyamuni and his disciples. At the centre, Shakyamuni is shown seated on an elaborate throne with two disciples—Shariputra (right) and Maudgalyayana (left)—standing on either side. In a column (eight figures on either side) are the 16 Arhats (elders). Also represented are the four protector Guardian kings in the bottom row. The column of Arhats is followed by two columns of attendant figures on either side—in red, yellow, blue, white and green body colours (Fig. 3). East Wall (Fig. 4): Starting from the north end, on the eastern wall is a fine depiction of Yamaraja (the bull-headed God of Death), holding a pasha (lasso) in one hand and a flaming sword raised high over the shoulder, in the other (Fig. 5). Next to Yamaraja, is a six-armed Mahakala (Gombo), with elephant skin over the back, held stretched in two hands, also holding a trident and a rosary. The hands in the centre hold a pasha and a damru (drum). The figure is shown with two arms close to the chest, holding a vajra (thunderbolt) in one hand and a kapala (skull) in the other (Fig. 6). The attendants and other associated figures are placed in a register above the main figure. 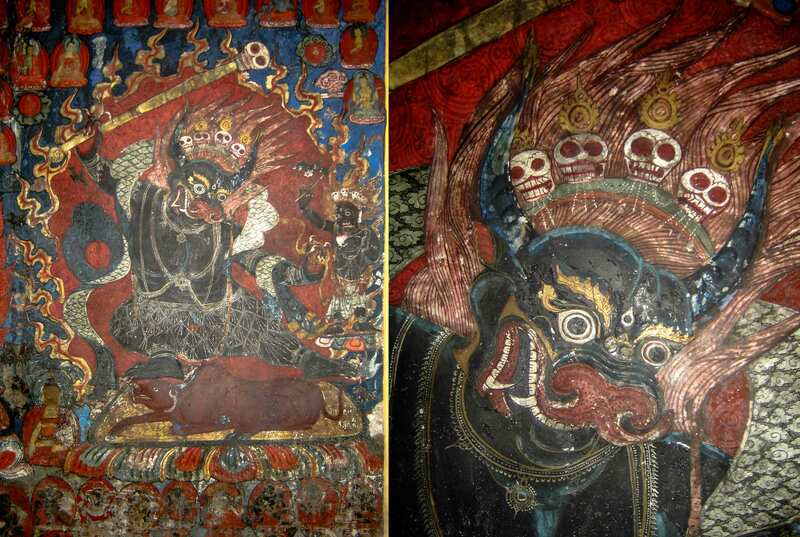 Next to the Mahakala is a fine depiction of Yamantaka (a representation of Manjushri), with his consort (Fig. 7). He is shown with nine heads—three wrathful on each side of the main bullhead, and stacked on top are two more—one wrathful and one fierce; the topmost head has a peaceful visage. The figure is dynamic with multiple hands holding various ayudhas (implements and weapons following specific iconographic injunction), and is surrounded by attendants and family. In contrast to the fierce deities, the panel next to Shakyamuni is that of Tsongkhapa (founder of the Gelugpa sect—Yellow Hat), with his two disciples—Gyaltsap and Kedrup—standing on either side (Fig. 8). 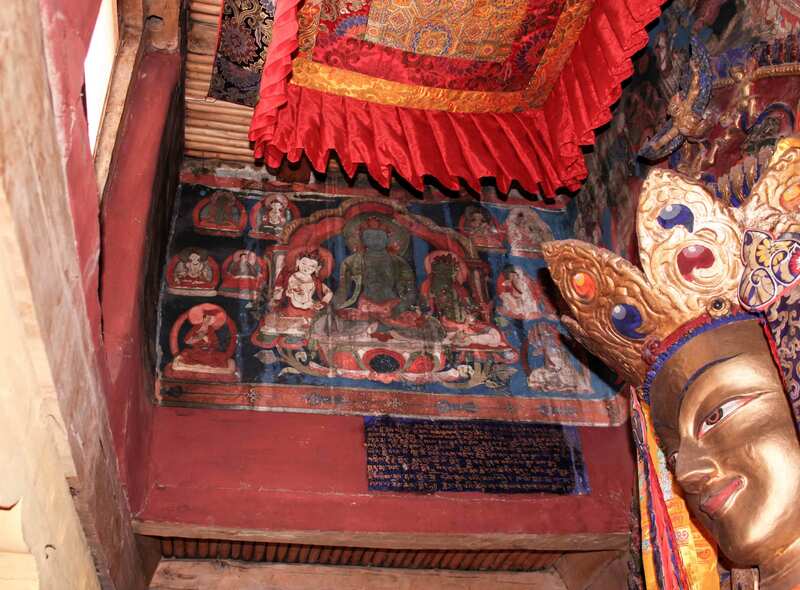 On either side above the throne are the lineage masters and other attendant figures. West Wall (Fig. 9): The first panel next to the north wall was severely damaged and has been partially restored following surviving evidence. 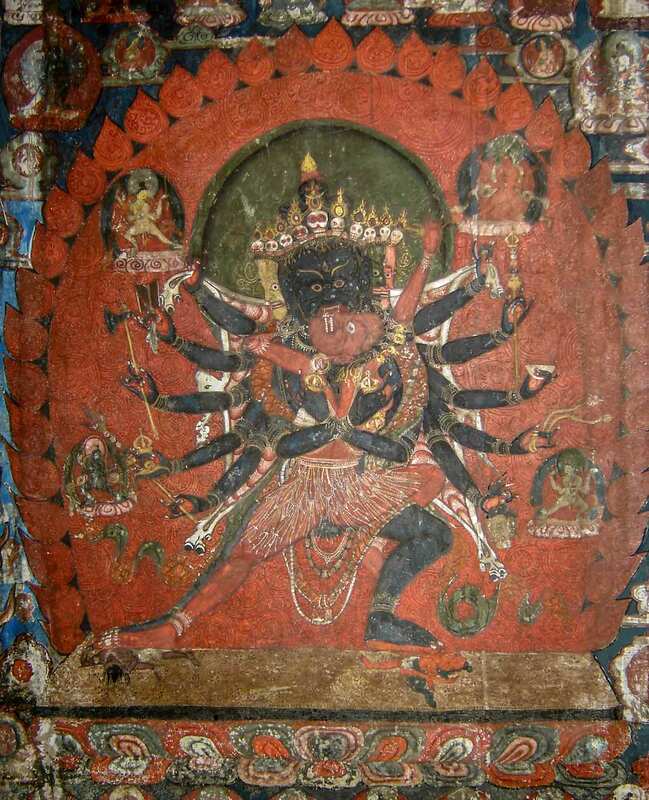 Chaturbhuja Mahakala (four-armed Mahakala) is seen in lalitasana (posture of ease), holding a sword raised above the shoulder and a trident in two hands. In his arms held close to the chest, he holds a vajra and a skull cup. 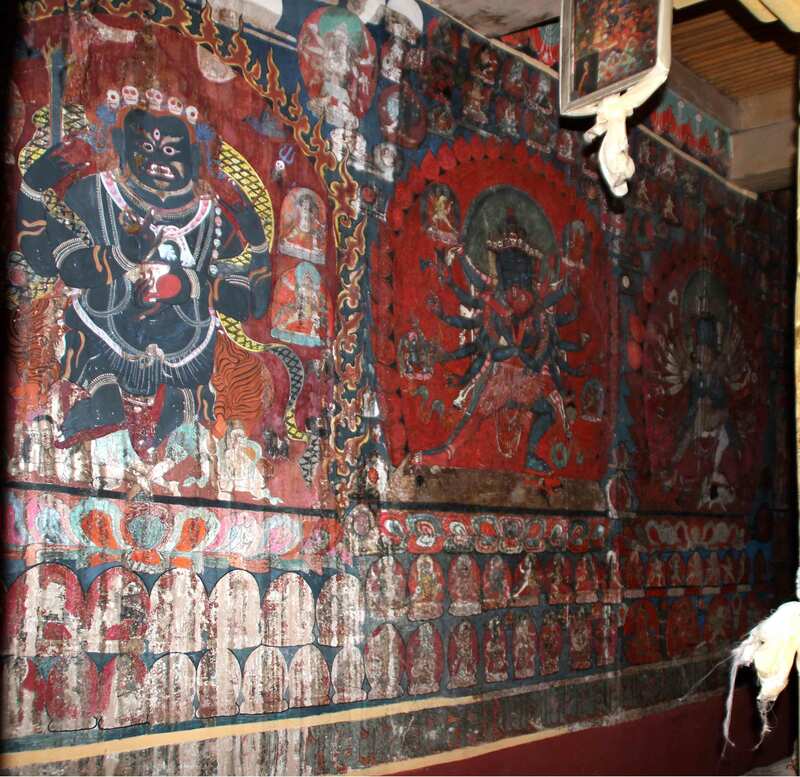 Chaturbhuja Mahakala is surrounded by attendant figures and other icons of the kula (family). 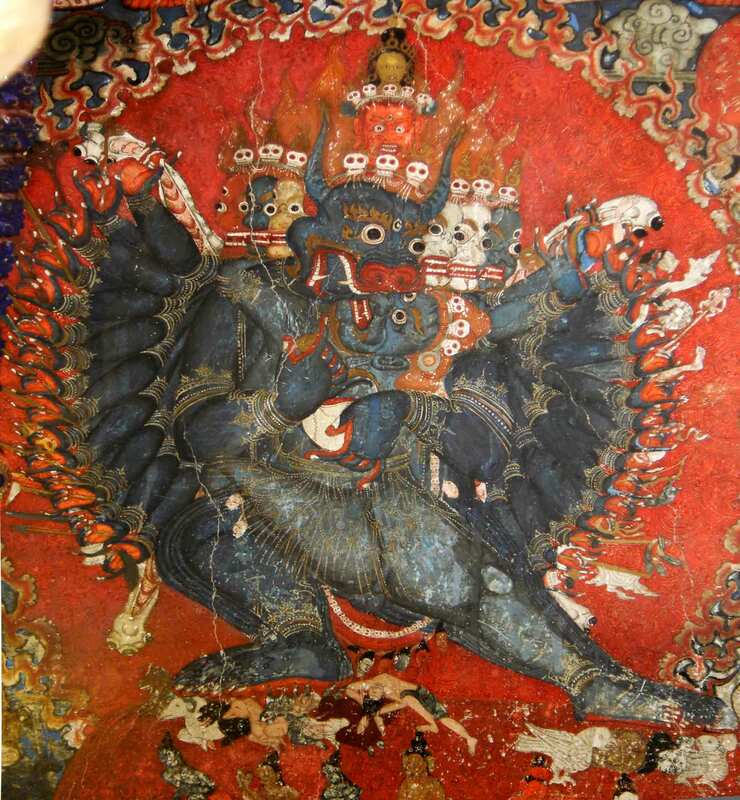 Next to the Mahakala is a representation of Chakrasamhara with five heads, holding his consort. This is one of the most important figures in the Kagyu pantheon. Two arms are crossed around the consort with a vajra in both hands. The other five pairs of arms on both sides are spread out, with each hand shown holding an ayudha. The figure is surrounded by attendant figures. Next to Chakrasamahara (Fig 10) is a wrathful depiction of Kalachakra, with his consort Vishwamata, in elaborate jewellery and costume, with four heads, 12 pairs of arms and 24 hands, each with an ayudha. The legs are stretched—lending to the aggression in the posture, with the face painted black, and the teeth exposed. This image is followed by a seated figure of Vajradhara with his arms crossed close to the chest, holding a vajra in both hands. The area had been damaged and has been partially restored. Avalokiteswara Padmapani (Fig. 11) and Vajrapani stand on either side of Vajradhara. Above, in two rows are other attendant figures in small roundels. North Wall (Fig. 12): The wall was damaged due to water seepage, and the area has been restored. On either side of the door, in the top row are various lesser deities. Below this row, on each side, are the protector deities. At a small section of the wall, on one side of the door, there is a depiction of a scene from the Basgo Fort, with the king and his retinue shown. This is a significant record of how the artists chose to depict their surroundings. The panel is unique as it does not follow the conventional format of showing the royal family (patrons and donors). The scene shows the Basgo Hill in terraces, with a caravan load of goods in the lower register. The subsequent registers show the goods being taken up to the King, who is shown by the Queen, with his retinue seated in the palace at the top of the hill (Figs. 13 and 14). The area under this panel is blank but must have had an inscription, which is now completely lost. 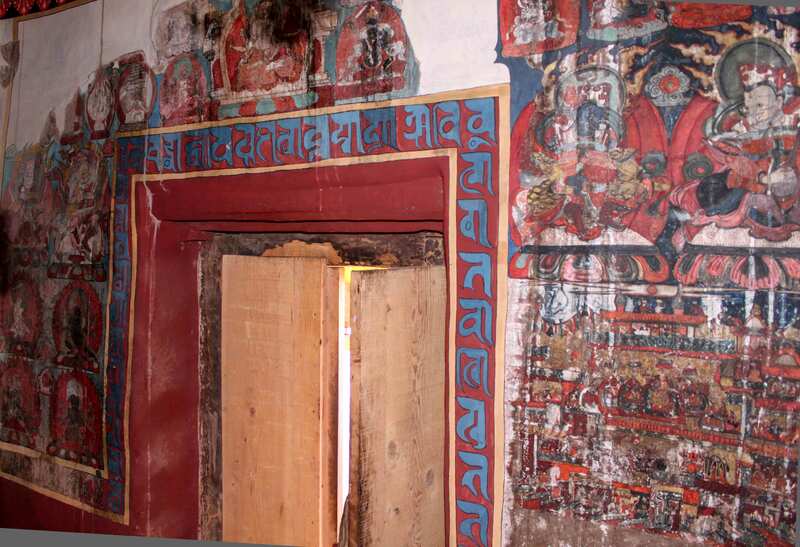 The other side was extensively damaged due to water seepage and only the protector deities can be recognised and have been pictorially integrated on the basis of the remaining paint layer. The space inside the lantern (Fig. 15) also has paintings. 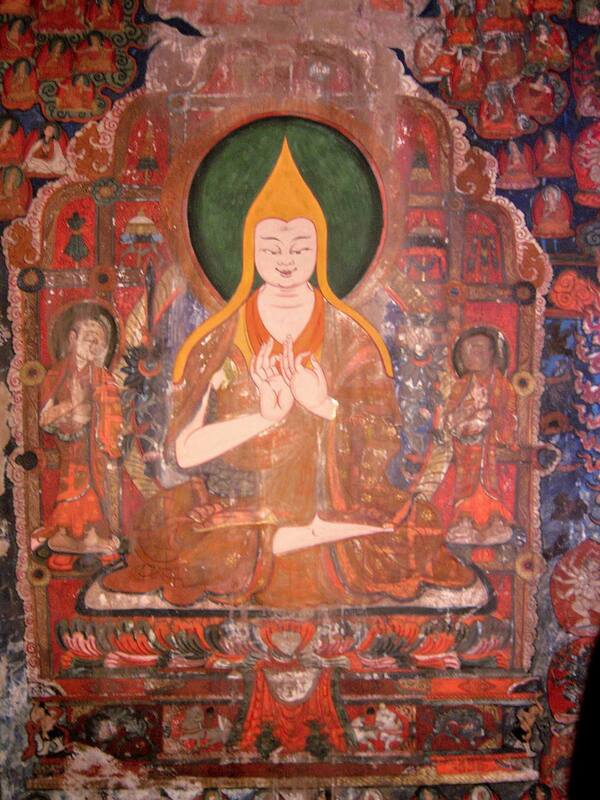 The compositions are of Shakyamuni with attendants, and another is of Tsongkhapa with his disciples. 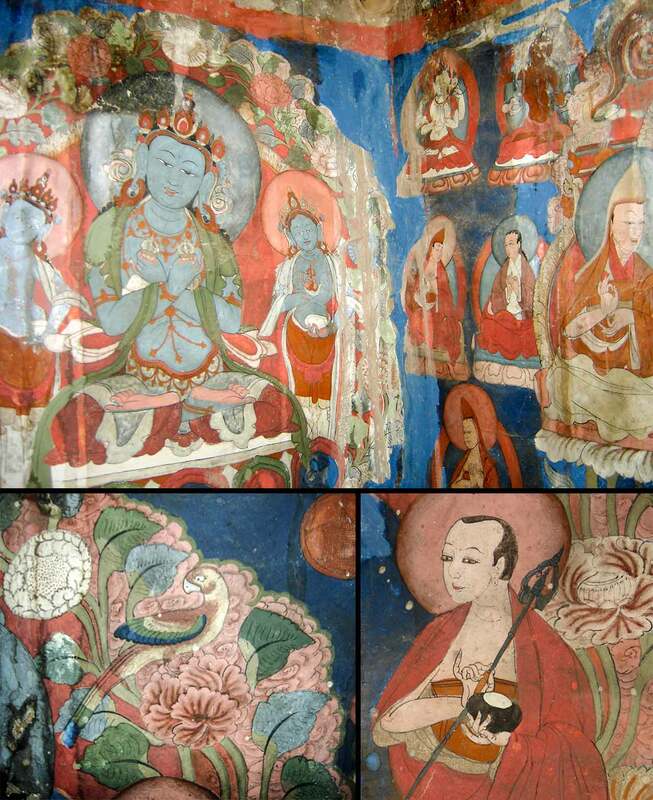 The rendition and colouring of these paintings are significantly different from the rest of the paintings in the temple (Fig. 16).